DevBlog 104 / More weapons, more fun! Hello everyone, hope you’ve all had a pleasant week! One of these weapons lets you be one step ahead of your enemies, guess which! Guilty feet have got no rhythm! The new dodge animation, wip! Last but not least, we kept the QA and bug squashing going, and every week that passes the game feels better and plays better, which is extremely gratifying and motivating! That’s all for this week, have a pleasant weekend and stay tuned for more! This entry was posted in Animation, Concept Art, Dev Blog, Gameplay, Programming, WIP and tagged Animation, Concept, Gameplay, WIP on May 4, 2018 by admin. Another week full of polishing touches and bug fixing has passed. 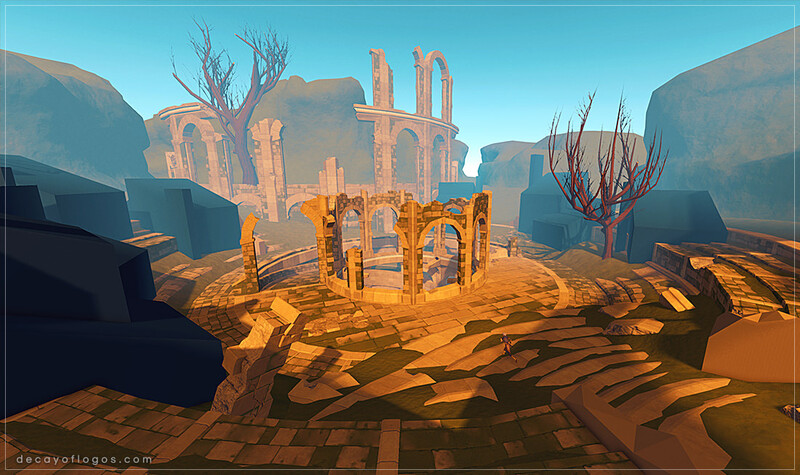 The development of the final area is going well, and it provides some breathtaking visuals together with a good opportunity for introspection as you make your way through its scenery. Regarding the new version of the main character, she is now in-game, as you can see in the following gifs. Old Ada served us well throughout development, she will never be forgotten! The way to the Elk’s heart is through its stomach, obviously. We’re still retouching some animations because her anatomy is a bit different, and our new smith is refitting the armors as well for this same reason, of course. Fly like an eagle, sting like a bee! It’s hard to express in words how we are all pleased with this new version of the main character, we feel it was the right call and everyone worked extra hard to put her into the game prior to the game’s release. We hope you’ve enjoyed this post and the sneak peek we’ve provided into the reborn Ada, see you all next week! This entry was posted in Animation, Dev Blog, Gameplay, WIP and tagged 3D, Animation, Gameplay, Interactions, Showcase, Technical, WIP on March 9, 2018 by admin. We weren’t expecting our plaster DevBlog post to become so popular, so we considered talking about bricks today..! Jokes aside, we’ve had alot on our platter for this week, so let’s get right into it! We’re working hard… I mean, we’re always working hard, but lately we’ve been putting some extra muscle into a show build for the upcoming Expo’s! More information will be shared when the time comes, please bear with us. A new NPC has also been added to the world, her name is Nuri and she’s a large blacksmith that will be tucked away inside of her shop, providing additional conversations and a new mechanic to the game. Where’s this Blacksmith I read about on the blog? She will offer to repair your items, if they are worth her time, that is! Don’t bother trying to get her to fix your flimsy, rusty swords and battered straps of wood, pieced together as makeshift armor! You can jump but you can’t hide! And here’s the latest, new and glorious animation, the new jumping while sprinting that will be invaluable for bypassing gaps and traps. On a final note, we’ve also been doing a pass on all the cutscenes for the game, revamping the old and starting to work on the new! This entry was posted in Animation, Dev Blog, Gameplay, Level Design, Programming, WIP and tagged Animation, Gameplay, Showcase, WIP on February 16, 2018 by admin. 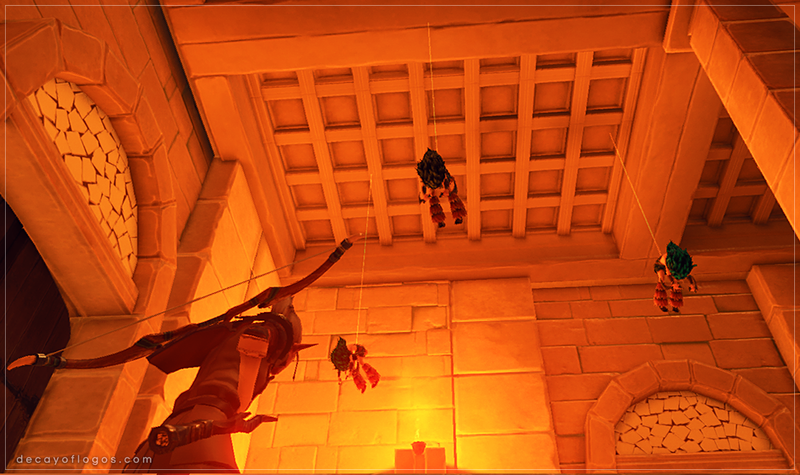 DevBlog 89 / What sorcery is this? As promised last week, we’re bringing you some magical goodness for this devblog… so without further ado, let’s all put on our robes, wizard hats and get our hocus pocus on! *Ahem* Oh! And please take note that both the names and effects are work-in-progress! Magic in the world of Decay of Logos is called Magicae, an ancient art that has been nearly lost to time, and that may only be tapped into by prodigious individuals with a strong life essence. Light spell and Fire potion in action. While we’ve decided that it would be optional for players to learn and use Magicae, those who choose to practice it must be aware that it comes at a cost, as it will slowly drain one’s vitality. – The Light spell will be useful for navigating dark areas without the need of handling a torch, and might even blind some enemies. – Shockwave will damage and push certain enemies away, possibly causing some of them to topple! – Finally, the Fireball will do what fireballs do best, burn and bring pain to your foes! The anti/drinkable potions remove the respective status effect from the main character, while the appliable ones are used to enchant the currently wielded weapon for a short duration, causing each attack to stack the effect on enemies! Shockwave spell and Paralyze potion in action. Similar to the spells, some enemies may be resistant or even immune to certain effects, while others vulnerable. Feel free to experiment on them, for magical science! That will be all for this week, hope you’ve enjoyed the reveal of this new mechanic and that you partake in the mystical arts of Magicae when you get your hands on the game! Ah, yes, you can take off your robe and wizard hat now… bye! This entry was posted in Animation, Dev Blog, Gameplay, WIP and tagged Animation, Gameplay, Showcase, WIP on January 19, 2018 by admin. Here’s our cat-proof Christmas tree! HAPPY HOLIDAYS! The team wishes you a Merry Christmas and a Happy New Year! 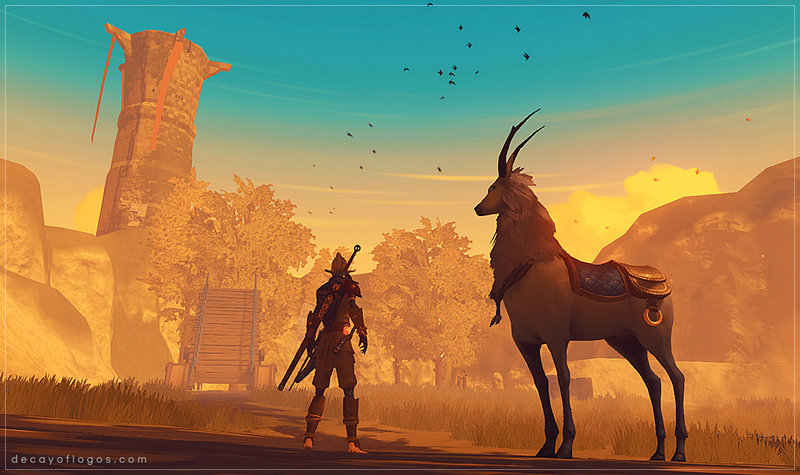 We’re taking some time off to be with our other loved ones, and would like to thank all of you who follow our DevBlog posts and keep up with our game’s development. Get ready for a new year full of new surprises and adventures, we’ll see you soon! This entry was posted in Animation and tagged Animation on December 22, 2017 by admin. DevBlog 86 / Full Steam ahead! If you’ve ever heard of Steam, or if you’re currently using it, you’ll probably be ecstatic to know that we’ve included the Steam API into our project! This allows us to have some sweet features such as Achievements, Cloud Saving and Stat tracking. It also means that our game might or might not be on Steam… take a guess. Since you’ve probably guessed it right, we can also share that our Steam page will be online in the near future, so stay tuned! What is this? It’s our navigation mesh for the Canyon Puzzle, which had some issues that are now solved through navmesh control, allowing it to be updated as required by this event. New area accessible by boat! What is that? 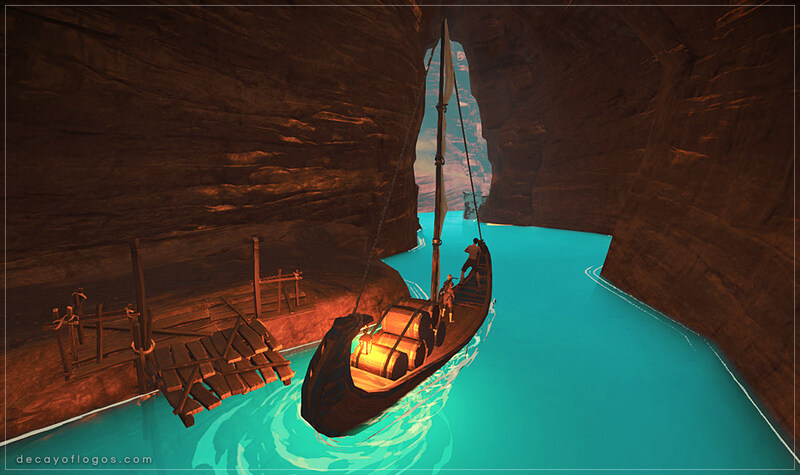 The boat we’ve showcased before is nearly fully implemented, and it will allow our hero to go forth and explore a new area which contains a quest item, some additional challenges and loot, of course! A sanctuary, its buildings currently work-in-progress. 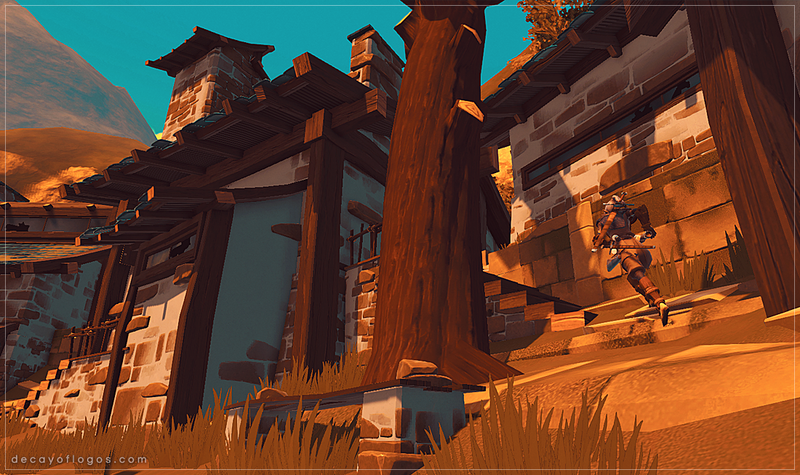 And this is the Village Hub we’ve mentioned before, which is shaping up to become a sanctuary to all, being not only rich in visual storytelling, but also holding its share of secrets! Oh, the houses are still work-in-progress, as such they are enveloped in a black, velvet fabric. This tool will definitely come in handy! Our Master Puppeteer, or Animator as some would call him, has implemented his new physics tool that will allow him to breathe even more life into his Puppets! We asked him how he does it, he said “Animation Magic”. That is all for this week, everyone is thrilled for having the game on Steam and for all the progress that has been made so far, we can’t wait for the upcoming devblogs and to share more Decay of Logos goodies, so thank you for reading! This entry was posted in Animation, Dev Blog, Gameplay, Level Design, Programming, WIP and tagged 3D, Animation, Concept, Gameplay, Showcase, WIP on December 15, 2017 by admin. DevBlog 85 / What’s hiding behind the masks? 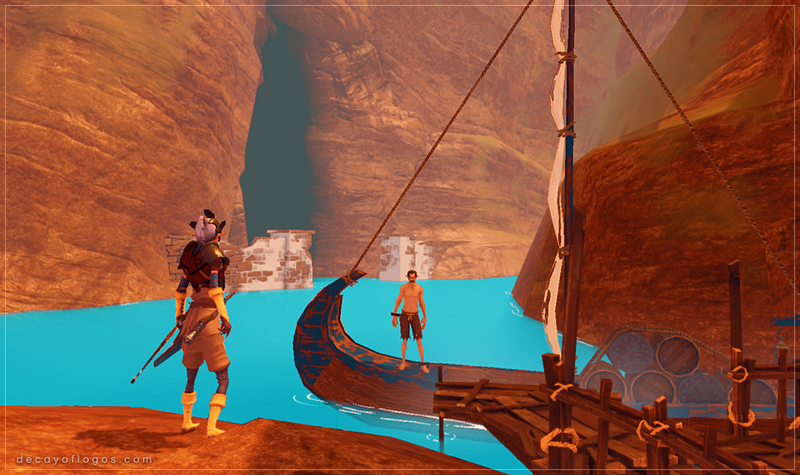 Work on the Canyon Zone is coming to a closure as our craftsmen have been polishing it up while implementing its last mechanics, such as the boat that was revealed in a previous DevBlog, NPC placement for storytelling purposes, as well as a new puzzle that will give access to a very special place. It involves a few masks and… that’s all we’ll share, for now! I’m masking you a question! The village hub has been getting some love as well, even though we’re not ready to share a screenshot of its current state, rest assured that it will be an area which will always spark your interest, no matter how many times you revisit it. We’ve also been working on the last key characters for the game, which we’re not going to spoil for you just yet, maybe sometime in the future as we’d like to keep some of them a mystery at least for the time being! The Royal Guard, however, keeps insisting on making an appearance on every blog post. Someone just took a wrong turn! As usual, we’re happy to indulge, as he’s been getting a few new animations and some further polish as you can see by the screenshot. That’s all folks, thank you for tuning in and have a pleasant weekend! This entry was posted in Animation, Dev Blog, Gameplay, Level Design, Programming and tagged 3D, Animation, Gameplay, Interactions, Props on December 8, 2017 by admin. DevBlog 84 / A Hole new area to explore! A Hole new area to explore! 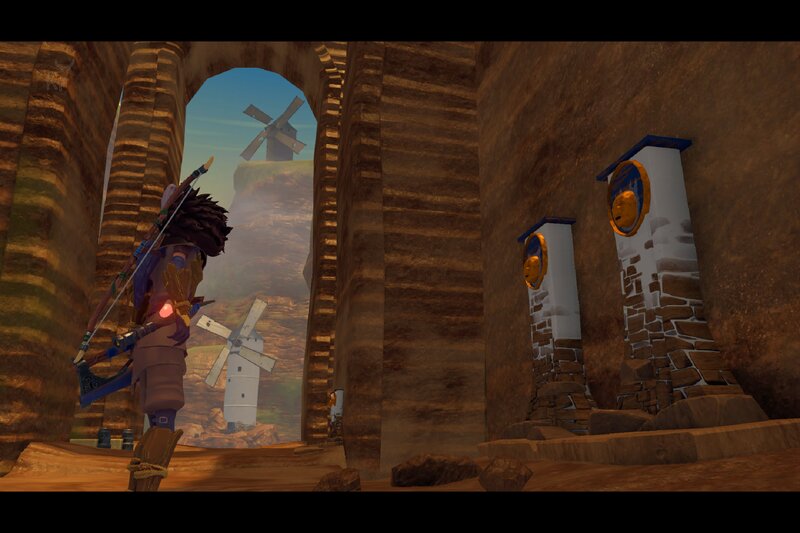 This week we’ve made great progress in populating the Bottom Rift Windmills area, which is nearly fully implemented in regards to both props and logic, as we’ve also prepared it for our area streaming system! Ambushes and enemy placement throughout this area have been carefully considered as so to provide a different feel and encouraging players to be on their toes at all times. The Royal Guard continues to learn new moves, preparing himself to become one of the most dangerous and challenging elements of the game’s combat, one many would try to avoid rather than engage. That is all for this week, we hope you’ve enjoyed this week’s updates, and thank you for tuning in! This entry was posted in Animation, Dev Blog, Gameplay, Level Design, Programming, WIP and tagged 3D, Animation, Concept, Gameplay, Showcase on December 1, 2017 by admin. DevBlog 83 / Pole-ishing things up a bit! Hopefully you’ve all been having a blast stockpiling gifts for your dearest ones and yourselves too (come on, you deserve it!) during this week’s amazing sales! If not, that’s fine too! But we digress… the DevBlog post #83 is here for your delightment! 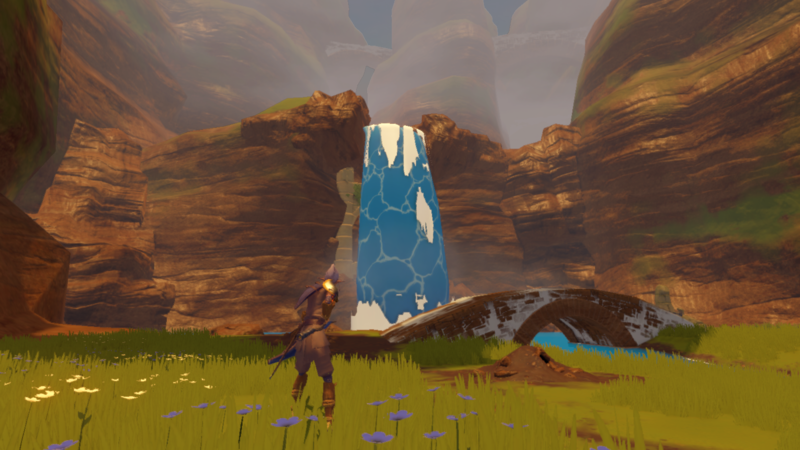 We’ve been performing the final pass on building the Canyon Area, which includes the logic for the area’s content, gameplay and general flow. The main puzzle we mentioned in the last DevBlog post, within the Roratory Temple, is now complete and fully functional, and all that is left now is to build up some dungeons and spice up the already existing ones! The renowned dancer that was waving his weapon around last time we wrote you, or the Royal Guard if you prefer, is coming to life in terms of gameplay… basically he’s being taught how to make your lives miserable! And he’s really committed to it! The Canyon Kids have also picked up a couple of tricks, we felt that despite being really agile they were but lacking in the sneakiness department, so we fixed it! Don’t worry, they’re in battery saving mode! Hope you’ve enjoyed this week’s post, stay tuned for more and thank you for reading! This entry was posted in Animation, Dev Blog, Gameplay, Level Design and tagged 3D, Animation, Gameplay, Interactions, WIP on November 24, 2017 by admin. 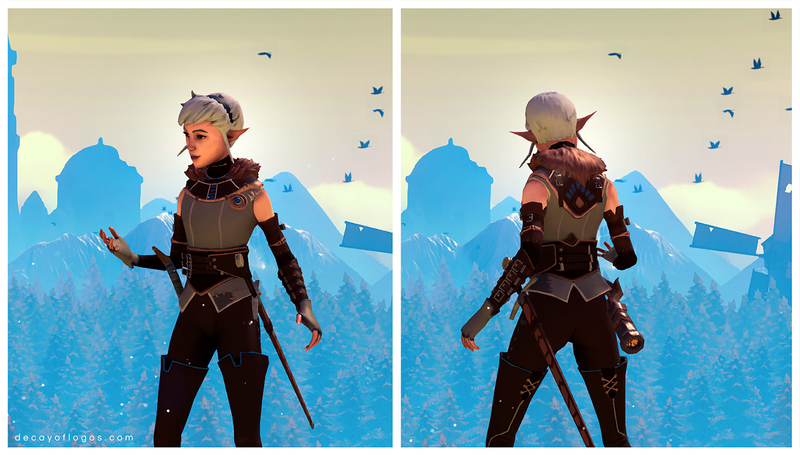 DevBlog 82 / Boy does she look puzzled! We are almost finished with the largest puzzle that you’ll have to tackle in the game, it’s been a blast designing it and seeing it come to life as we all expected! This puzzle will be present within the Rotatory Temple, and it draws inspiration from the Rubik’s Cube, which was part of our team’s childhood and maybe yours as well, so without further ado here’s a little something for you! Our QA barbers have combed the lands thoroughly for even more nasties, trapping them all in neatly organized cages for the programmers to do some pest control… we take bug hunting seriously, honest! Oh, the Elite Guard you saw in the last DevBlogs is already in the game, and he’s picking up some groovy moves, look! Just Albert swinging its Halberd. Lastly, the Canyon zone continued being spruced up, and it’s looking damn good! 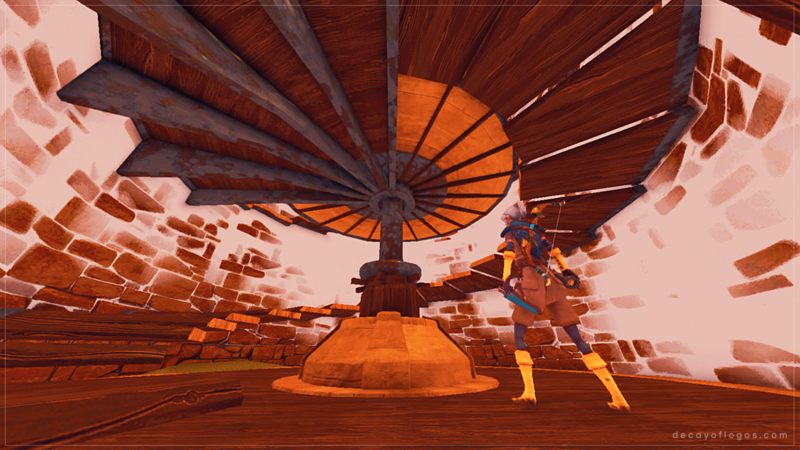 We’ve even added the interior for a Windmill that you may or may not find… what’s up there you ask? Well, you’ll have to find that out for yourself as well! We promise it’s not flour! That’s it for this week’s DevBlog, we hope you’ve enjoyed it and that you have an amazing weekend, see you next week and thank you for reading! This entry was posted in Animation, Gameplay, Level Design and tagged 3D, Animation, Gameplay, Interactions on November 17, 2017 by admin.